One of the step to be a registered TESDA graduate is to get a National Certificates (NC) or Certificates of Competency (COC). This is your proof that you enroll and pass all the exam under the course you've take. You can also use this document when you are applying for a job. How to Get a Certificate in TESDA? Step 1: The first thing you should do is provide a 3 pcs. Passport size ID picture with white background, use white shirt with collar. Don't forget to write your name and signature at the back of the photo. 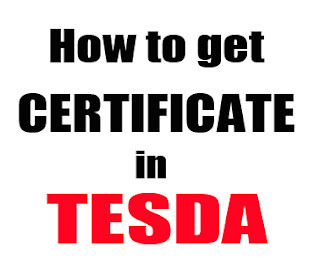 Step 2: Go to the nearest TESDA Accredited Assessment Center in your area and apply for assessment. Step 3: Submit the picture and the following documentary requirements and pay the assessment fee. 2.Properly and completely filled-out Self Assessment Guide of your chosen qualification. Step 4: Get the Official Receipt and Admission Slip (Please bring this on your scheduled date). Note: The scheduled date and assigned venue of assessment was indicated in the Admission Slip. Step 5: Pass the assessment and get the Competency Assessment Result Summary (CARS). Step 6: Apply for the assessment in TESDA District/Provincial Office where the assessment center/venue is under jurisdiction. Step 7: Your National Certificate (NC)/Certificate of Competency (COC) can be claim in 7 working days. Remember that the applicant can only get the documents. However, a Special Power of Attorney (SPA) should be submited if a representative will claimed the NC/COC.